The 2015 recording was obtained by Charlie Page (Ohio BFRO) in northeast Ohio's Cuyahoga Valley National Park (CVNP) around 11pm in March. There have been sporadic sightings, sounds and track finds near and within this park for decades. 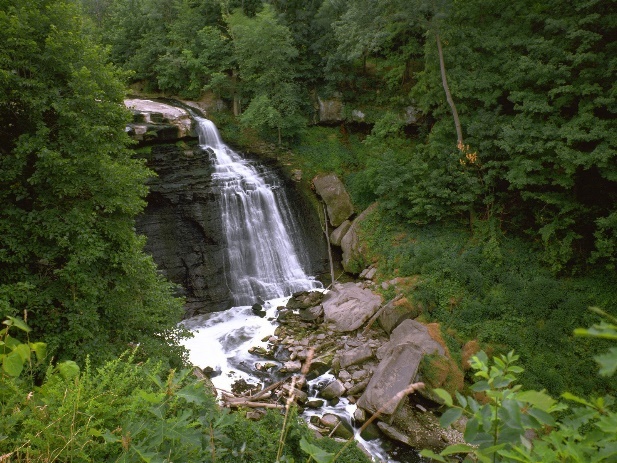 It is an amazing, beautiful area but it is not well known outside Ohio. The size of the park is 52 square miles, 50% larger than Manhattan (34 square miles). Charlie says his sound recorder was within 1000 feet of a scenic vista point named Hemlock Point. The white noise in the background is traffic noise from a freeway (I-271) which cuts through the park. The animal howls more than once from basically the same area but seems to face a different direction for each howl. Distant response whoops can be heard in the background at points. The 1994 recording was obtained by Matt Moneymaker (BFRO founder) 50 miles to the east of the Cuyahoga recording area. Known as the "Ohio Howl" for the past 20 years, this recording has consistently stumped animal sound experts. All scientific analysis has concluded that it was not a mechanical device nor was it the vocalization of any known animal. Looking across the Cuyahoga Valley from the Ledges area. The 2015 recording was recorded in the vicinity of Hemlock Point. Hemlock Point can be seen in the distance in the photo above. It is directly on the other side of the valley. The expanse of forest you see above is only a small slice of the entire national park. The geology is karst - ancient weathered limestone hills and cliffs with thousands of caves and overhangs of various sizes. 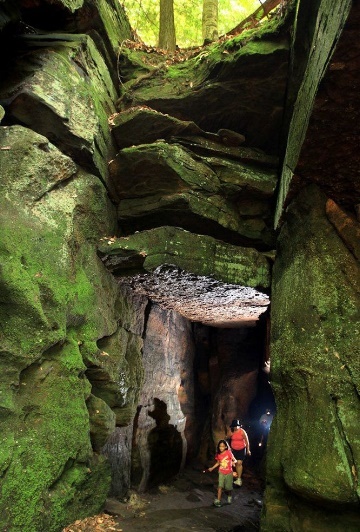 Most of the caves are never seen by the park visitors because they are too far off the trail. Humans stick to the trails because it can be treacherous otherwise. There are many wild nooks and grottos for a family of sasquatches to hide. This region is one of the rainiest parts of the midwest. It receives as much rain as rainforests in the Pacific Northwest. 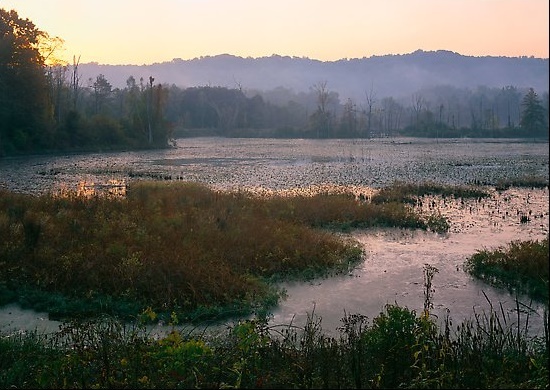 The CVNP has many large marshes surrounded by lush nut-bearing forests. There are also many large cornfields just outside the park boundaries. This combination of ingredients along with frequent rains gives rise to an abundance of small animals and deer herds, all of which provide sustenance for predators such as coyotes and sasquatches. There's no way to know if sasquatches live year round in the CVNP but it is very, very possible. Due to the abundant food, water, hidden caves, and the prohibition against hunting, a dozen or so sasquatches could survive there unseen. 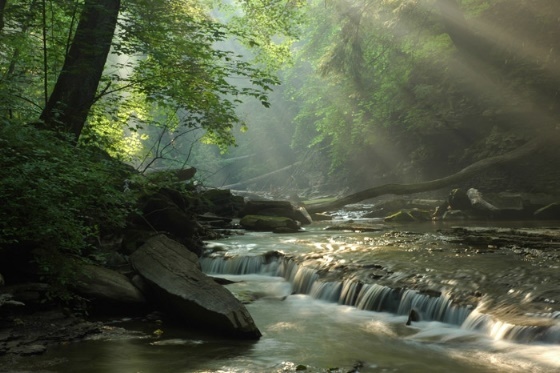 However it is more likely that sasquatches move in and out of the CVNP from surrounding counties. Sasquatches are nomadic and do not reside permanently in any particular valley or cave. Their nomadic pattern and nocturnal schedule along with their avoidance of humans makes it virtually impossible for sasquatches to be studied closely by scientists. They will quickly abandon any area if they feel threatened by human encroachment. Thus audio recordings like the one obtained by Charlie Page may be the only practical way to track and identify sasquatches over the long term. Compared to the odds of seeing a sasquatch, the odds of hearing a sasquatch are relatively good. As thousands of BFRO expedition attendees will attest, you can hear sasquatches making sounds in the woods at night if you are in the right place at the right time of year. The 1994 howl recording from the Ohio River was obtained in November of that year, whereas the 2015 howl was recorded in March. Moaning howls have been reported in both winter and summer also.Thus sasquatches might howl at any time of year, like coyotes. A well organized, year-long sound monitoring/recording project inside the CVNP would be required to capture all of their loudest sounds (howls, whoops and knocks) throughout the year. It has never been done before anywhere and it would definitely yield more amazing recordings and useful scientific data. It would yield data about several species while not affecting those species in an way. Click the image above for a larger version of the Ohio elevation (relief) map. 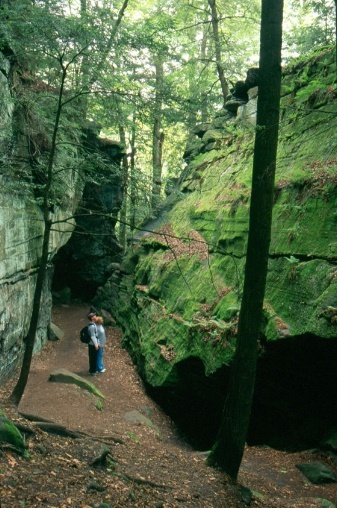 One particularly tantalizing thing about sasquatches potentially being in the CVNP: They would undoubtedly use the caves in the CVNP because there are so many in there. If certain caves can be identified then it might be practical to set up hidden cameras near those caves (or even INSIDE the caves) during the times of the year when the sasquatches are residing elsewhere. A cave used by a family of sasquatches during winter and early spring would be very distinctive in one regard: It would contain piles of bedding in the form ofsoft grasses or piles of green maple leaves. They are very different from pack rat mounds. There are numerous pathways that sasquatches might use at night to reach the CVNP from surrounding counties in Ohio. In other parts of North America sasquatches seem to follow creeks, rivers and ridgelines when moving long distances. In region around the CVNP, sightings and track finds etc. suggest different primary pathways for long distance travel. Those primary pathways are high-tension powerline routes, abandoned railroad beds, the Buckeye Trail. 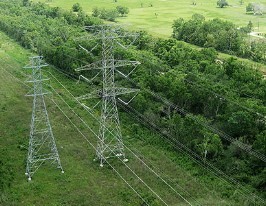 Many sightings occur along powerline routes. These mowed cuts extend for many miles in straight lines. Even across open pasturelands there is often a strip of trees on one or both sides that serves to cloak their unaesthetic appearance. Sasquatches will move along these strips of trees. They will only be spotted by humans on rare occasions in the wee hour of the morning where the powerline routes cross desolate rural roads. It is practically impossible to get lost or become disoriented when hiking along powerline routes because the towers and wires are so visible from a distance, even in the dark. If the tree cover is too thick to see them then you can still hear them because they buzz. Deer herds follow these routes also. 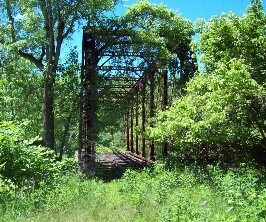 In northeast Ohio there are several overgrown abandoned railroads (and bridges and tunnels) that extend for many miles. 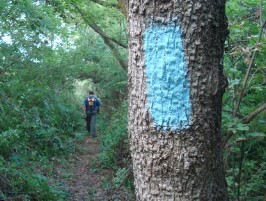 Only a few have been converted to hike/bike trails. It is much easier to follow an abandoned railroad bed in the dark than a typical game trail. Even in swamps, old railroads are usually set on gravel mounds a few feet above the ground, and they are straight paths or only gently curving. The paths make only gentle inclines or declines, and the gravel base prevens footprints unless there is snow on the ground. Sasquatches try to avoid leaving obvious footprints on the trails they use but they can't avoid leaving tracks in snow. Abandonned railroad beds in known sighting areas are THE BEST places to look for real sasquatch tracks in snowy months. For many years sightings, tracks and sounds have been heard near the Pacific Crest Trail, the Continental Divide Trail, the Appalachian Trail, and parts of the Buckeye Trail in Ohio. Sasquatches have undoubtedly observed and shadowed backpackers along these trails in the past. They are smart enough to notice that some hiking trails go through the richest forests in the states they cross. Those major hiking trails also avoid civilization as much as possible. Footprints are rarely found right on popular hiking trails. Footprints are more often found on nearby "stalking trails" -- trails that run parallel to a primary trail, usually 100 feet or so distant from the primary trail. On rare occasions when a footprint is found right on a popular hiking trail the footprint is always *crossing* the trail rather than walking along the trail like a human. One of the most exhilarating things you can do in northeast Ohio on a summer night is to ride the main bike trail (the Towpath Trail) through the heart of the CVNP. Starry skies and fireflies give the valley a magical feel. The forest smell is intoxicating and the animal sounds are astounding. 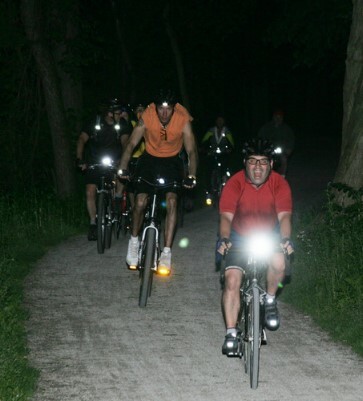 Bicyclists do not ride through the CVNP at night without lights attached. With no lights attached it would be very easy to crash into a tree or be struck by some other bicyclist. But those lights make it is easy for sasquatches to spot the bicyclists and avoid them. Drivers are apparently far more likely to spot sasquatches at night than bicyclists, probably because headlights on vehicles illuminate so much further into the distance, and sasquatches have much less time to hide before they are lit up by the headlights.